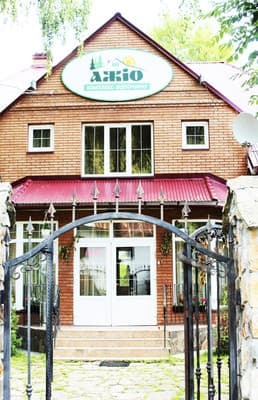 Recreation complex "Agio" is located in the village of Kolochava, in one of the centers of historical values ​​and museums of Transcarpathia. 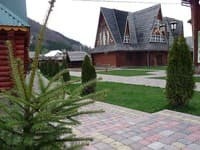 Kolochava is known for its cultural and historical monuments both in Ukraine and far beyond its borders. 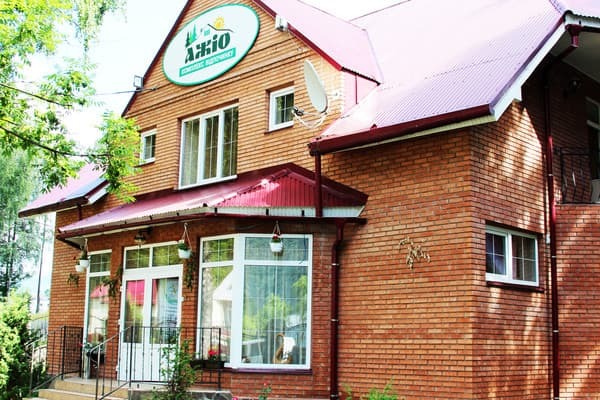 Tourist complex "Agio" is a two-story brick building and a separate wooden cottage. 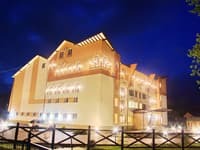 The hotel consists of 14 rooms of different levels of comfort. Each room of the complex "Agio" is equipped with modern appliances, comfortable furniture and its own bathroom. Free Wi-Fi is available. Rooms are cleaned daily, bed linen is changed every 7 days. At the disposal of tourists is also a sauna, the possibility of ordering individual or dietary meals, excursions, transfers, organization of conferences and much more. Not far from the complex there is a mineral spring "Burkut", to try the water from which everyone can drink. And fresh air will help to enjoy a picnic in the mountains and relax from everyday life. From the hotel "Agio" to the nearest ski lift - 10 km, to the nearest railway station Volovets - 70 km. The famous Synevyr lake is 29 km from the complex. 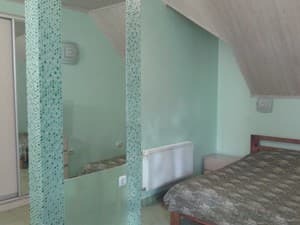 Description of the room: The room has 6 single beds. Description of the room: The spacious room is equipped with a double bed and a single bed. 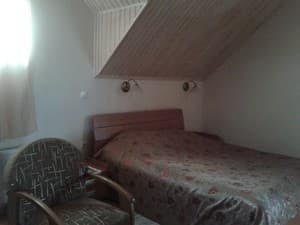 Description of the room: The room has a comfortable double bed and a sofa bed. Refrigerator is one for 2 rooms. 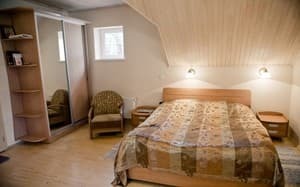 Description of the room: The room is equipped with four single beds. Отель расположен в очень живописном месте. Окружен горами и историческими памятниками. Отзывчивый персонал готов протянуть рука помощи и с легкостью найти ответы на все ваши вопросы. 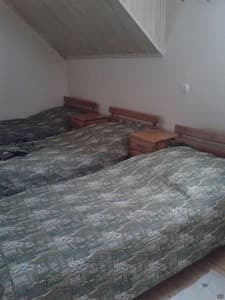 Extra bed for an adult is 150 UAH, for children - 75 UAH. The hotel has a cafe where you can eat. 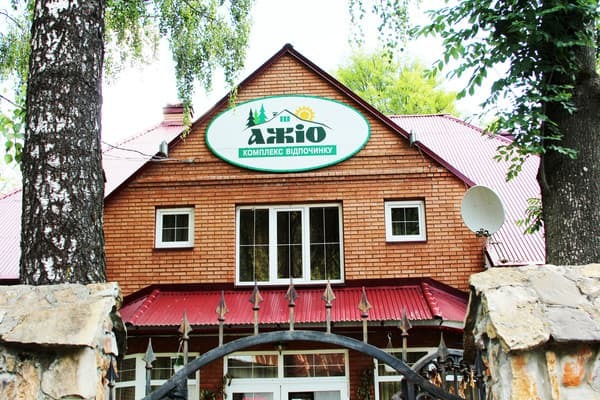 Recreation complex "Agio" is located in the village of Kolochava, 30 km from the village Mizhhiria. From the hotel "Agio" to the nearest ski lift - 10 km to the nearest railway station Volovets - 70km. The famous lake Synevir is located 29 km from the complex. 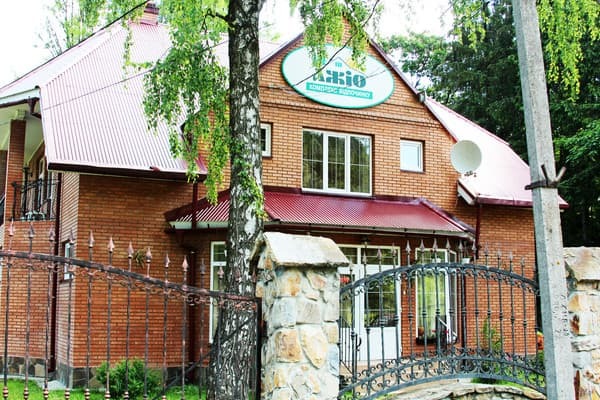 Trains Uzhgorod direction to the station Volovets, then by bus to the center Kolochava. By bus Lviv - Khust, Lviv - Tyachiv, Kiev - Khust up to the village. Mizhhiria, then by bus to the center of Kolochava village. By car: along the highway Kiev - Lviv - Chop (M-06), per sec. Turn the Lower Gates to Volovets, go in the direction of Mezhgorye. In Mezhgorye turn in the direction of the sign "Kolochava" and go along the main road to the center of Kolochava village.